Stephen John Cuthbert, born 1985, is a dedicated and talented Singer Songwriter from North East England's pretty seaside resort of Redcar. Recently I had the opportunity to ask Stephen about his passion for music and I wasn't surprised to learn that music has pretty much been a part of his life since he was little. As we all know, it takes a great deal of talent to be a songwriter, and Stephen has a creative knack for bringing together descriptive, heart felt lyrics with catchy and appealing sounds. In fact you would think by the album Stephen put together last year, that he had been writing music all of his life. However he pointed out that although he's always maintained a deep connection to music, he didn't in fact get down to writing his own songs until 2013....and get down to writing he did! His self titled Album, Here and Standing, offers 11 original songs, featuring the first song he ever wrote called 'Money Tree'. When asking Stephen where he gets his inspiration to write, he indicated he 'usually needs to be in a particular mood, but that most of his lyrics come to him as he's about to drop off to sleep at night'...which is why he keeps his iPhone handy to quickly jot his new ideas down! I was curious to know what comes first - the music or the lyrics - and he said that he does not have a set pattern when he writes; sometimes a particular chord sequence will come to mind and he'll adjust the lyrics to fit. But he also states the reverse happens; he can write a full song, then fit the music around it. Although he's in the early stages of his career, he's open to writing songs for other artists, so certainly he knows how to attack a songwriting project from any angle. Famed musical inspirations include, Elvis Presley, Michael Buble, and Trace Adkins. Stephen points out that he's not isolated to one genre in particular, and that he'll write for numerous genres, including country. Stephen remembers seeing famed X Factor success story James Arthur playing local pubs in his area prior to his being discovered and says that's when "it really hit home how if you stick to your dreams eventually you will get to where you want to be". Perseverance should never be underestimated. What a great interview and article Barbara! I do appreciate the introduction. 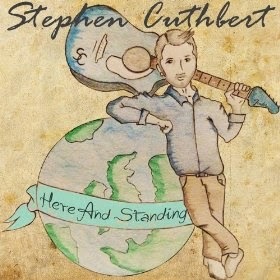 I believe this is the first time I have ever heard Stephen Cuthbert sing. I have often heart songwriters, writers in general, say that words, stories, lyrics and music come to them as the lay down to sleep or in their dreams. I have always believed that is because there are no other interruptions and our mind puts together the little scraps of thoughts that we have had though out the day, but didn't have time to capture and consider. I look forward to listening now to more of Stephen's songs. Thank you! Thanks Cynthia, that's a valid point about dreams and how and why things seem to come to us - I've personally experienced that as well and yep, that sounds right! That's a wonderful review. I don't have much time for music these days, but it used to be a big part of my life before I started selling books and writing. I miss it. I find I begin writing some of my articles in my head as I'm dropping off to sleep and I have to get up and write them down so I don't forget them.